Image via Black Lives Matter Minneapolis @ Flickr. In 2015 police killed at least 1,152 people in the US. Nearly 1 in 4 were killed by one of America’s 60 largest city police departments. Blacks were more likely to be killed by America’s largest city police departments. 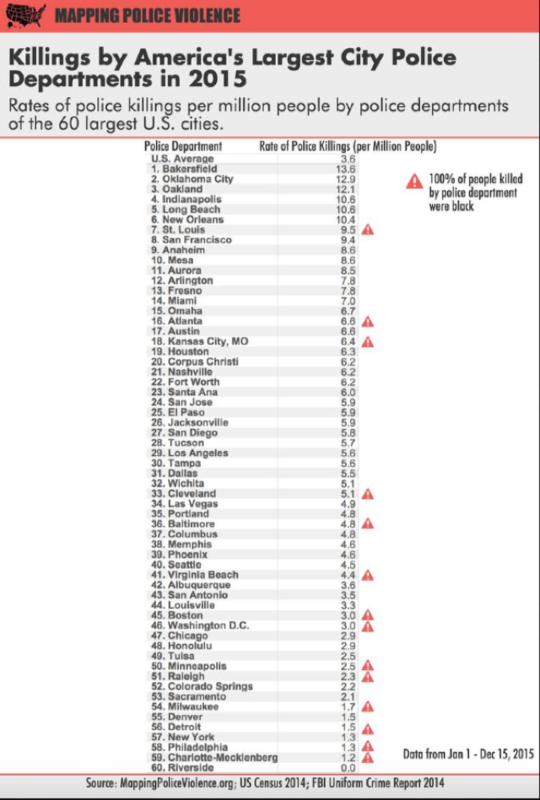 Police departments disproportionately killed black people, who were 41 percent of victims, despite being only 20 percent of the population in these cities. Of the 60 police departments, 41 disproportionately killed black people relative to the black populations in their jurisdiction. Fourteen of the police departments killed black people exclusively in 2015; 100 percent of the people they killed were black. Only 5 police departments killed whites exclusively. High levels of violent crime in communities did not make police any more or less likely to kill people. Police departments in high crimes cities like Detroit and Newark consistently killed fewer people per capita than police departments in cities with much lower crimes rates. 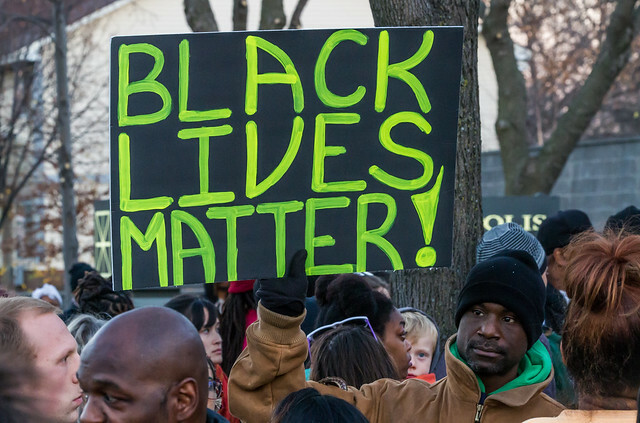 That data is being gathered and discussed is entirely due to the work of #BlackLivesMatter. The movement exposed the flesh and blood reality of state violence against African-Americans. ⌗BlackLivesMatter changed the public discourse through direct actions that demanded political candidates prove that black lives matter to them, and say what they would do to end structural racism. The movement’s most famous and most effective disruption came when ⌗BlackLivesMatter stormed the stage at a Netroots Nation event in Phoenix, Arizona, to demand that Democratic presidential candidates Sen. Bernie Sanders and former Maryland governor Martin O’Malley address police violence against African-Americans, and put racial justice at the center of their campaigns. The action initially riled Sanders and some progressives, who interpreted the action as an attack, felt Sanders — given his history on civil rights — was the last person ⌗BlackLivesMatter should be attacking. However, ⌗BlackLivesMatter was applying pressure where it is most likely to yield results. Doing the same to Republican candidates would have been a waste of time and resources. But Democrats were more likely to move forward on issues they shouldn’t have needed to be pushed to address. ⌗BlackLivesMatter’s willingness to embrace confrontation worked. Sanders immediately exhibited a willingness to address the concerns of ⌗BlackLivesMatter activists. Sanders was the first candidate to speak out against the arrest and death of Sandra Bland. One week after Phoenix, Sanders delivered a speech to the national gathering of the Southern Christian Leadership conference, in which he connected structural racism and economic inequality in stronger terms than any 2016 presidential candidate has before or since. He has since earned the endorsement of influential hip hop artists and activist Killer Mike. 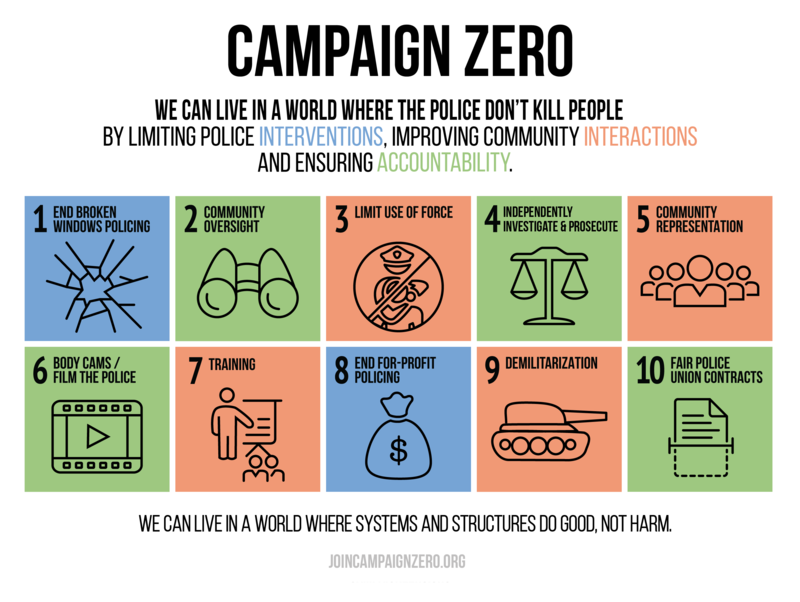 Campaign Zero put candidates and officeholders at every level of government on notice that the movement’s concerns were real, and its demands were clear. ⌗BlackLivesMatter has shifted public opinion, too. According to a recent Pew poll, 50 percent of Americans believe racism is a “big problem” in America— up 17 points from the last time Pew asked this question, in 2010. In a November CNN/Kaiser Family Foundation poll, 49 percent of Americans say racism is a “big problem” — a significant increase from 28 percent just four years ago. Fifty-nine percent believe changes are necessary to give African-Americans equal rights — up from 46 percent last year. Fifteen police officers have been charged with murder or manslaughter this year (not including the six Baltimore officers facing trial in the death of Freddie Gray). That’s triple the average of just five per year, from 2005 to 2014. These changes are largely due to ⌗BlackLivesMatter. The movement’s success hasn’t gone unnoticed. It’s been the target of rhetorical attacks from right-wing, Republican pundits, and violent attacks from white-supremacist, right-wing extremists who shot at ⌗BlackLivesMatter activists in Minneapolis. To Republicans, the success of ⌗BlackLivesMatter represents a threat to their agenda. That’s why they want to stop it. To Democrats, ⌗BlackLivesMatter presents a challenge. Founding member Patrice Cullors — who created the ⌗BlackLivesMatter hashtag — recently told Al Jazeera that it’s important for the movement to challenge Democrats, because “They’ve received a free pass in the black community,” and “They’ve really milked our votes without giving many results.” Though activists have shown up at several Donald Trump, Cullors said Republicans are “too far gone.” But Democrats, as “the party that’s supposed to be the, quote, ‘party that’s on our side,’” has more to live up to. ⌗BlackLivesMatter is a young movement, literally and demographically. Democrats need young black voters, a key part of “the rising American electorate” that twice propelled Barack Obama into the white house. As Donovan X. Ramsey noted in the New York Times, “the political party of our parents doesn’t seem to know how to reach us” — the black millennials powering the ⌗BlackLivesMatter movement. Democrats aren’t at risk of losing these voters to Republicans, but nor can it take them for granted. Black millennials won’t flip to the GOP, but they can cost the Democrats more than 2 million votes if they stay at home on election day. Democrats will have to change their outreach style and strategy, if they want to hold on to young African-Americans who embrace direct action, and demand it from those who seek their votes.